Rabbit teeth grow continuously throughout their lives. Normal chewing action wears them down just to the point that they don't overgrow. This is one of the reasons it is important to feed your rabbit a high fiber diet. 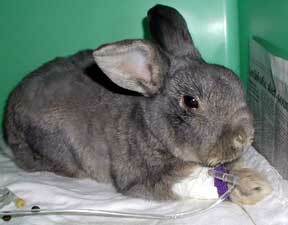 A rabbit that has a malocclusion does not have this normal wearing action and can suffer overgrown teeth. This problem can be serious enough to inhibit the ability to eat. Most rabbits do fine if their teeth are trimmed periodically. On select cases we will remove the problem teeth. 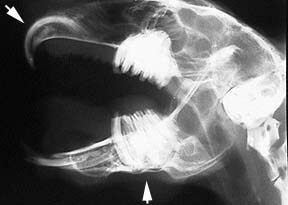 Before we begin click here to see an x-ray of a rabbits mouth to view incisors and molars. Come back here after you have reviewed rabbit tooth anatomy. 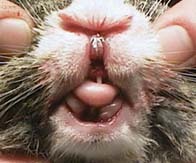 Even though the upper incisors are not as long as the lower, they also need trimming because they are growing into the lower jaw. Our friend feels much better, and can now get back to normal rabbit activity. He needs to return in 2-4 weeks to have his teeth checked. As you saw from the x-ray pictures the roots of these incisors are very deep and they curve significantly. Great care must be taken during their removal so they don't crack at the root. In this picture we are gently breaking down the attachment of the tooth to the gums. This is the appearance immediately after surgery. 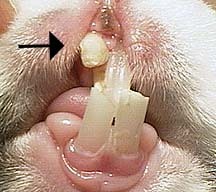 In some rabbits the problem is much more serious than overgrown and unsightly incisors. 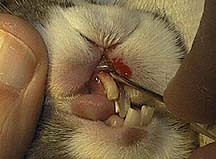 These rabbits have severe problems with their molar teeth, preventing them from eating properly. If untreated they can die. A large part of their problem is a diet that is too low in fiber. This causes improper wearing down of the molars, and even can lead to elongation of the roots of the incisors. Rabbits with this problem are not eating well, losing weight, and are slobbering. Looking into a rabbits mouth is not the easiest thing in the world to do. Not only do they find it distasteful, but their skin folds make it near impossible to visualize the teeth without anesthesia and proper instruments. When the molar teeth don't wear down properly they develop points that pinch the gums and make chewing painful. 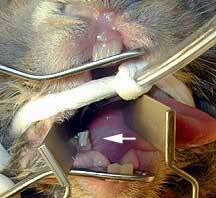 These rabbits are treated by filing the molars down until they become smooth, and instituting a higher fiber diet. 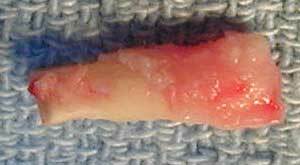 In some cases the chronic molar problem causes the roots to elongate. 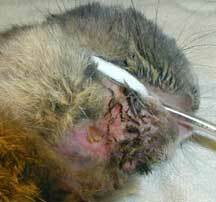 This is a serious problem, that can lead to abscesses, pain, inability to eat, and even death. This is a picture of Mike. He has overgrown molar roots that we will be removing. 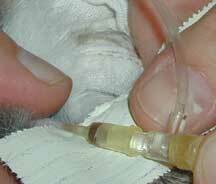 His IV catheter is giving him fluids just prior to anesthesia. 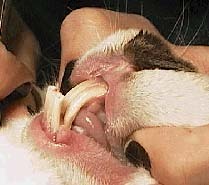 Before you attempt to treat one of these rabbits you need instruments enabling proper exposure of the teeth. These rabbits need complete anesthesia for proper treatment. 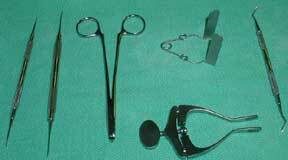 We use a very safe gas anesthesia and usually intubate for an additional margin of safety. The arrow points to the beginning of the breathing tube as it enters the mouth from the left. You can trace it as it courses down and to the right. We diagnosed Mike's problems partially by a history of weight loss and poor appetite, along with excessive salivation.You can see the chronic irritation the saliva has caused on his chin. 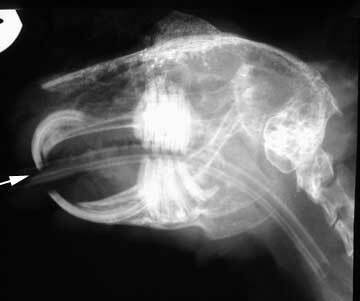 A radiograph was also helpful in the diagnosis. The arrow points to the elongation of the roots of the molar teeth. Compare it to the rabbit below with normal molar roots. These roots are normal. The arrow on the left points to the incisors, the one below points to the molars. 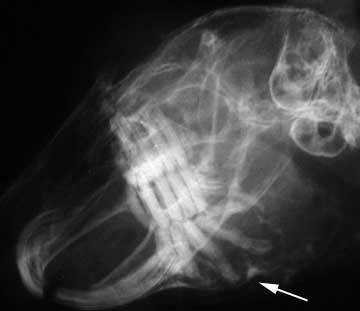 Can you see the difference in the molars from the abnormal rabbit above. Unfortunately, Mike had more than teeth problems. He had abcesses in his eye and on his tongue caused by Pasteurella. 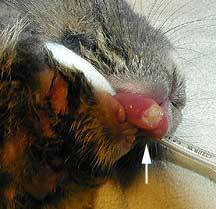 The arrow points to the ulcer he has on the tip of his tongue. One of the most important things you can do to keep your rabbit's teeth healthy is to feed a high fiber diet. This consists of mostly timothy hay or timothy hay pellets.